Coldwater Creek Fall Fashion Review: Get The Lowdown! 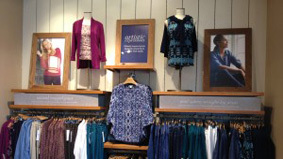 Coldwater Creek has long been a fashion favorite for baby boomer women. With consistently comfortable, traditional lines infused with “classic style trends”, Coldwater Creek has earned a seat at the big girls fashion table for quite a few years. This season there are beautiful colors…rich blues, greens and purples along with vibrant yellows and soft browns and beiges…some really great textures in the sweaters and blouses along with some ethnic influences that are spot on. You might not think of Coldwater Creek as being a go-to destination for jeans, but if not, you’re missing out! Their jeans feel like made-to-fit for midlife shapes, with several styles and options to choose from. I really liked the jeans with the leather accents…really trendy and cool. My favorite item was the stretch jeans. Somehow I escaped ever having purchased these before, although they have sold them for some time. They felt so soft in the store that I was afraid they would stretch over time and bag out at the knees and the derriere. Well, I got a pair in a beautiful chocolate brown, have been wearing them for weeks, and I am amazed and thrilled that they have only gotten better over time. These are comfortable beyond belief, fitting the middle-aged lines, curves, bumps and lumps quite beautifully without pulling or binding. The best part? They go EVERYWHERE. They are professional/casual when paired with heels and a short jacket, and weekend-appropriate for everything from ball games to hanging around the house. I seriously love these jeans. This fall’s line has more age-appropriate styles than I have seen in some time, and I love the fact that their line makes shopping for career clothes effortless and affordable. Shopping at the Stuyvesant Plaza Coldwater Creek store was definitely a pleasure….the staff was warmly professional and very helpful. Check out the photos of the clothing line (available online, of course!) – images will increase when you click on them so you can get a better look. Happy Shopping!